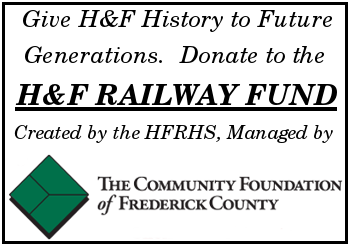 The Hagerstown & Frederick Railway Historical Society, Inc. website does not collect your personally identifying information without your knowledge. Some non-personally identifying information can at times be collected, which helps us to improve our website for visitors. This includes general tracking information including and similar to your website browser version, any page errors you might encounter, your country or state, and which website pages you viewed. This information cannot be used to locate any personal information which would identify you. Our members are provided with login access to certain portions of our website. These accounts provide us access to our members’ email addresses, however all other personally identifying information is voluntary. This information is used to maintain our contact records and provide newsletters and other emails. Any emails and personally identifying information collected on our website is not sold, and is not shared or used by anyone other than the Hagerstown & Frederick Railway Historical Society, Inc. or its officers.